Size of this preview: 800 × 501 pixels. Other resolutions: 320 × 200 pixels | 640 × 401 pixels | 1,024 × 641 pixels | 1,280 × 801 pixels | 2,326 × 1,456 pixels. 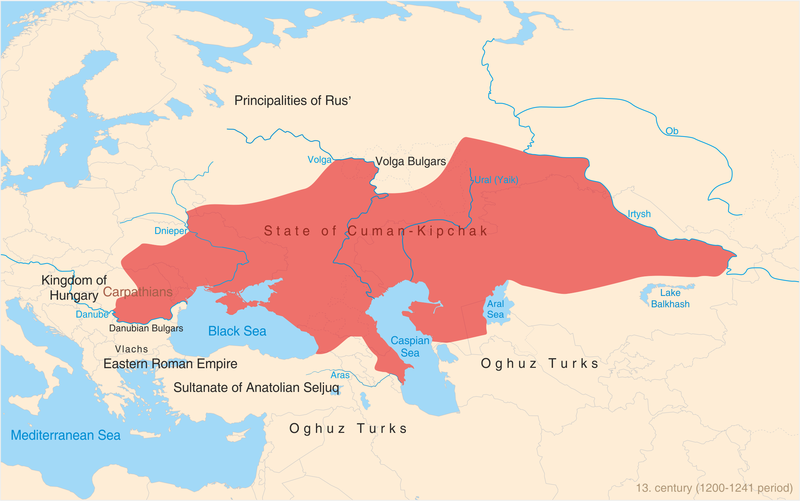 English: Map of State of Cuman-Kipchaks in the 13th Century (1200-1241 period) with todays (2011) borders. Türkçe: 13. yüzyılda (1200-1241 dönemi) Kuman-Kıpçak ülkesi haritasının İngilizce varyantı. Bugünkü (2011) devlet sınırları da belirtilmiştir. The Public Schools Historical Atlas by Charles Colbeck. Longmans, Green; New York; London; Bombay. 1905. Eurasia before the mongolian invasion. current 11:54, 22 June 2013 2,326 × 1,456 (623 KB) Photo Balkan (talk | contribs) Fixed one error.